Thanksgiving is right around the corner and we are all preparing for that perfect family meal to cheer. But have you thought of thanksgiving breakfast? 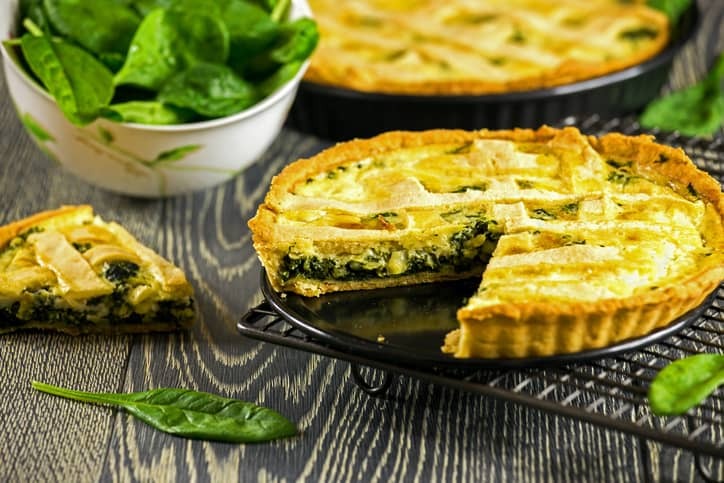 Try our family’s favorite recipe: cheesy spinach quiche. This is a delicious, nutritious, and easily made breakfast treat that you can serve with a side of fruit for a great breakfast. You can change it up by adding some of your favorite veggies. • 1 store bought pie crust. Defrost and prebake the pie crust for 8 minutes. 1. Defrost your pie crust. 2. Preheat oven to 350 degree F.
3. Thaw frozen spinach in microwave. Drain, blot and squeeze the water out of the spinach in the colander. 4. Put 1 tsp. olive oil in a skillet. 5. Put sliced mushrooms, onion, garlic, salt and pepper into skillet. Sautee these vegetables on medium heat. Make sure there is no water or moisture in the vegetables in the skillet. This will take about 6-8 minutes. Set aside. 6. Whisk together eggs, half & half, and the 1 cup of shredded cheese. Salt and pepper. 7. Add the sautéed vegetables and spinach to the egg mixture. 8. Pour the entire mixture into the baked pie shell. Top with 1/3 cup of grated parmesan cheese. 9. Bake the quiche until golden brown which should be 45-60 minutes. 10. Cool for 5 minutes before serving. 11. We love to freeze the leftover quiche slices. They are great to heat and enjoy at a later date. This quiche reheats beautifully.